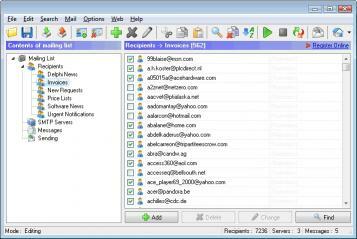 1st Mail Bomber is a professional email software mass mailer bulk mailer intended for fast sending personalized emails and mailing list management. It allows you to organize email-based subscription on your web site and to send newsletters information and notifications to a large number of recipients. You can create and manage thematic mailing lists import recipients from any files and to generate personalized messages from predefined templates while sending. 1st Mail Bomber has really unlimited abilities it can send emails in several different formats such as plain-text HTML and Outlook Express EML what enables you to dispatch colored messages with embedded graphics having an advanced look. Built-in SMTP manager can handle up to 48 different SMTP servers in 48 separate threads what makes sending very fast your speed will only depend on your connection speed if you set up SMTP manager correctly. 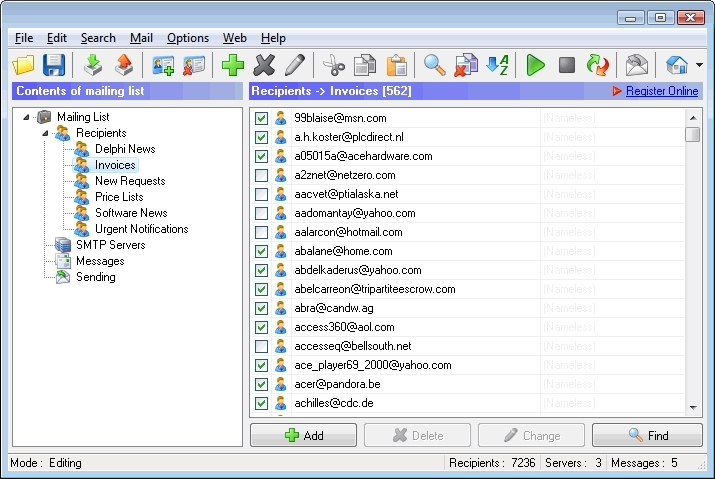 You can create separate mailling lists which contain unlimited structured recipient lists messages and SMTP servers as well as use a built-in connection scheduler to start sending at a desired time. The interface of the program is very simple and easy to learn - nearly all functions can be performed using hotkeys on the keyboard. This software is a handy tool for keeping feedback from your clients or users its a mailing list manager a simple and handy address book and a simple email program.